Rob (Boutique Accommodation) was fabulous. The house was perfect for what we needed and the kids had a wonderful time and were perfectly safe due to the house layout. The location was excellent. A short walk (3 minutes) to the beach but the house was tucked away so it was quiet and we had the pleasure of finding wallabies in our garden each night. Highly recommend. The most amazing deck overlooking trees and mountains, blissful! The house was large with plenty of space for everyone. Plenty of rooms for 3 families to enjoy and not get under each others feet. Big beautiful house!! great pool!!! Prefect for children.. Just need a gate if you have infants due to stairs in the house.. Overall great stay!! Lock in a great price for Trito - Luxury Holiday House – rated 8.5 by recent guests! One of our best sellers in Palm Cove! 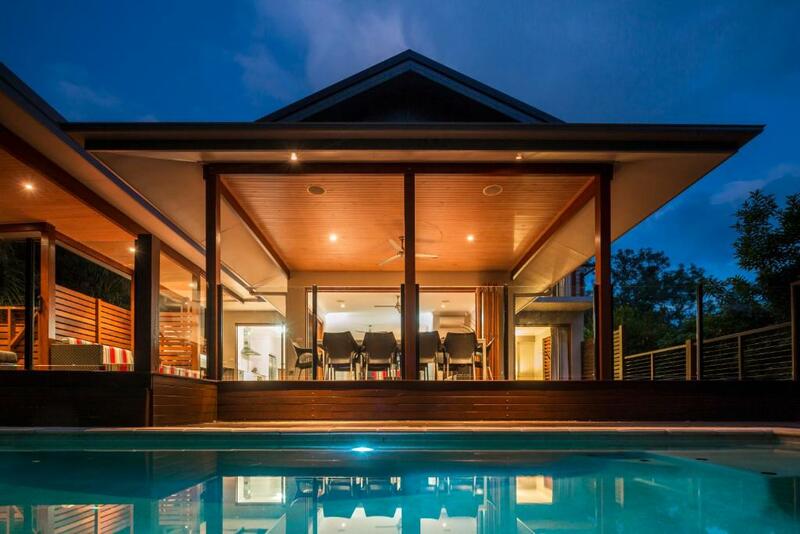 Located 5 minutes' walk from the beach and Palm Cove Esplanande, the 2-story, 4-bedroom Trito - Luxury Holiday House features panoramic views of the MacAlister Ranges. Guests have access to tennis courts, a fitness center and a swimming pool. Surrounded by lovely tropical gardens home to abundant bird life and wallabies, Trito Luxury Holiday House is 5 minutes' drive from Clifton Beach. It is 15 minutes' drive from the Tjapukai Aboriginal Cultural Park. Cairns Airport is 20 minutes' away. This air-conditioned holiday home features a large outdoor patio with BBQ facilities and a 10-seater dining setting. There is an open-plan fully equipped kitchen, laundry facilities and 3 bathrooms. The indoor courtyard offers a children’s play area. The ground floor offers a media room and 2 bedrooms, including the master bedroom which has an private bathroom with an outdoor bathtub. The two other bedrooms are located upstairs, and each offer a balcony. Trito is ideally located for trips to Port Douglas, the Atherton Tablelands, the Daintree Rainforest, Mossman Gorge and the Great Barrier Reef. Free daily bike rental is also provided. When would you like to stay at Trito - Luxury Holiday House? This air-conditioned holiday home features a large patio with BBQ facilities, 2 balconies and a fully equipped kitchen. All rooms include mosquito-proof windows and black-out curtains. House Rules Trito - Luxury Holiday House takes special requests – add in the next step! Trito - Luxury Holiday House accepts these cards and reserves the right to temporarily hold an amount prior to arrival. Please inform Trito - Luxury Holiday House of your expected arrival time in advance. You can use the Special Requests box when booking, or contact the property directly using the contact details in your confirmation. The house is located in a housing estate still under development. Properties immediately adjacent to the property and within close proximity are still under construction with noise and traffic associated with that construction starting at 6:30-7:00 in the morning and continuing throughout the day. The property management agency, 'The Boutique Collection', failed to inform us of the extent of construction prior to our arrival, resulting in our paying a premium high season price for the privilege of being woken early every morning with loud hammering, electric tools and construction noise. This property is misrepresented, and I will not be staying there, or any properties managed by the 'The Boutique Collection' again. This is not a relaxed or leisurely environment to spend your well-earned holiday time.